Is There A Method To Your March Madness? : The Two-Way It's time for basketball fans to fill in their brackets and predict which team will win every game in the NCAA tournament. What's the best way? Research? Flip a coin? Find a mascot you like? 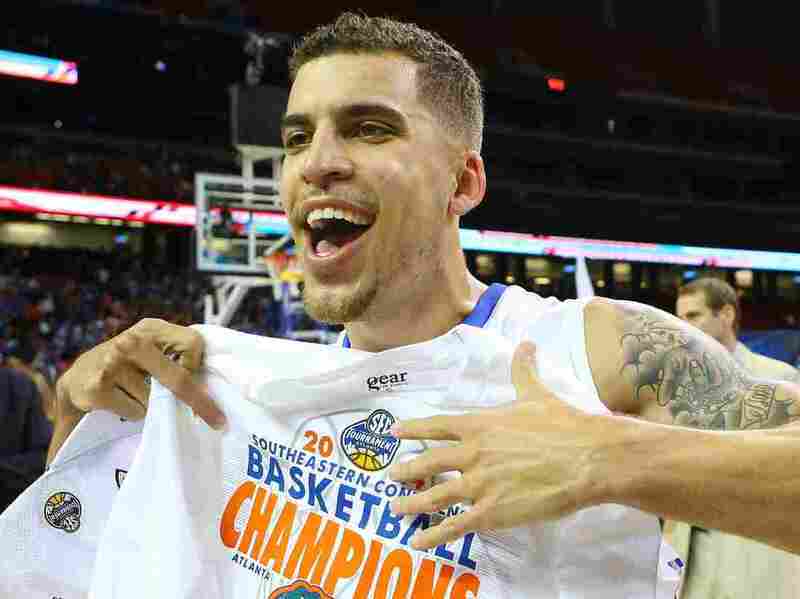 Florida guard Scottie Wilbekin and his teammates are among the teams thought to have a strong chance of winning this year's NCAA men's basketball tournament. Are the Gators your pick? The odds are that somebody in your office or shop is trying to get you to toss a few bucks into the pool and fill out the brackets for this year's NCAA men's basketball tournament, which gets underway tonight. Fans of the women's championship might also be after you. Or, maybe you're dreaming big and taking up that "Billion $ Bracket Challenge" from investment guru Warren Buffett and Quicken Loans. The annual question, though, is what strategy to use. That's especially important for us casual fans who don't really know whether Oklahoma is any better than Oklahoma State or why Michigan is a No. 2 seed in the Midwest region and Michigan State is a No. 4 in the East. Slate's Mike Pesca, who until recently was among our colleagues here at NPR, offers up his advice in this 17-minute video. He touts a combination of "empirically driven data" paired with "looking to zig when everyone else zags." But since practically the first thing Mike does in his video is make fun of the mascot for the Great Danes of Albany (this blogger's alma mater) as looking too much like Scooby Doo, we're not so sure we want to recommend Mike's method. Perhaps you might instead consider trusting Nate Silver and his staff at FiveThirtyEight.com. Silver is a prognosticator with quite a track record, after all. He turned his skill at sports analysis into political punditry and nailed the results of the past two presidential elections. FiveThirtyEight has an interactive bracket that shows the odds for each team of advancing through the tournament. Florida, the tournament's No. 1 overall seed, stands the best chance among the four region's No. 1 seeds, according to FiveThirtyEight. But even those Gators only have a 14 percent chance of making it all the way to the title. Update at 10:45 a.m. ET, March 19: The team with the "best" chance of winning the title, according to FiveThirtyEight, is Louisville — a No. 4 seed in the Midwest region. Louisville has a 15 percent chance of being the champion, in FiveThirtyEight's view, in part because of what may be an easier "path" to the finals. The best way to make your choices, though, might be to try The Wall Street Journal's "Blindfold Brackets" method. It takes you through the tournament, but with the teams' real identities removed. What you see is important information — such as how high a team was seeded, how tough its schedule was this season and how good its players are at 3-point shooting. The fact that you don't know the teams' real names, in theory, reduces the chance that you'll be biased one way or the other. We're told, by the way, that President Obama's annual appearance on ESPN to share his brackets is due to air Wednesday at midday. The president also fills out the brackets for the women's championship. If you're trying to do yours, the NCAA has the women's brackets posted here.